Watching Pita Sharples interviewed on TV3’s ‘The Nation’ on 5 July, two things occurred to me. There is every likelihood that, come election day, the Maori Party is doomed. If they are really, really, really lucky, they might win one seat. Perhaps. As much as I dislike National’s coalition lap-dogs, We may yet need the Maori Party. Up till now, I have wished for their hurried departure from Parliament. As a much-needed coalition ally to National, they have propped up this government and allowed various policies to be enacted that further the neo-liberal agenda at the expense of the majority of New Zealanders. But this, in turn, has meant that National and ACT have toned down much of the anti-Treaty rhetoric that Brash engaged in when he was leader of the Nats. When Brash gave his infamous Orewa speech in January 2004, the more conservative, reactionary element in New Zealand society rewarded him and his party with a huge (if short-lived) 17% ‘bounce’ in the polls. National’s strategists understand they cannot afford to alienate that support. 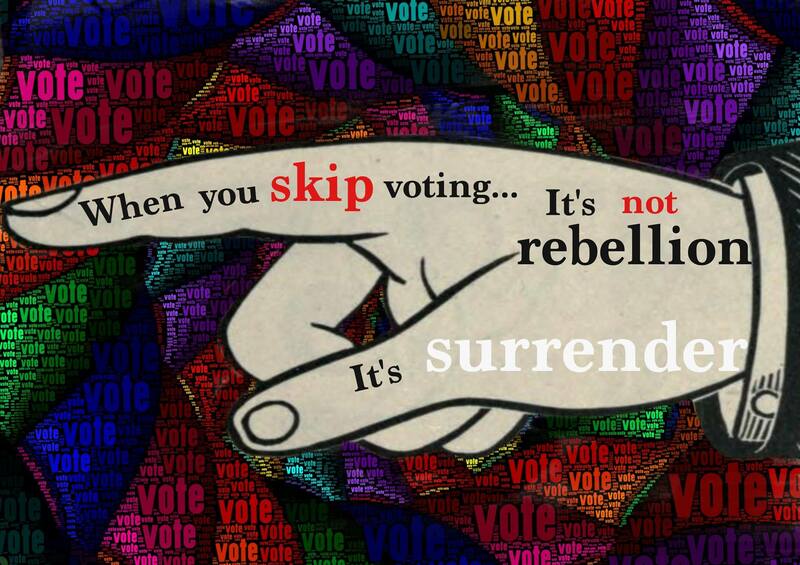 Not when every vote and every seat in Parliament counts. And not when this year’s election promises to be the narrowest-run race in decades. Keeping the Maori Party on-side has also meant losing a strategic tactic from the Right – playing the racist “Treaty Card”. National can no longer play that “card”. Not if it expects to keep the Maori Party as a coalition ally. This is an added ‘bonus’ for the Left. By removing anti-Treaty messages from National’s “arsenal” of available campaign strategies, racist rednecks no longer have a “natural political home” to vote for, en masse. As someone who has no love for National and it’s coalition allies, I have to grudgingly admit to a new-found use for the Maori Party – as a useful brake on National’s racist tendencies. Perhaps Labour and Mana should consider the strategy of “gifting” one of the seven Maori Electorates to the Maori Party? 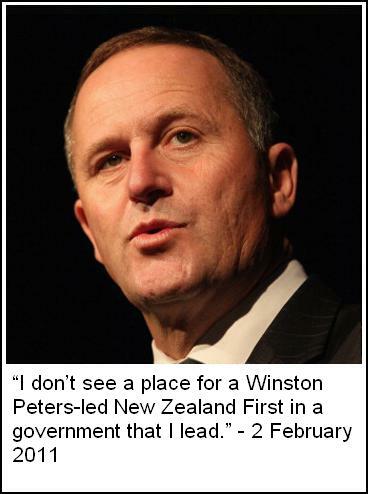 This blogpost was first published on The Daily Blog on 12 July 2014.
and leadership changes within New Zealand’s smaller political parties. “It needs the nuclear option. Yeah, right. After five years of coalition with the Tories, all that the Maori Party has to do is walk away and all is forgiven?! Never mind the damage they’ve done in the meantime?! Never mind National’s Key’s rejection of the Waitangi Tribunal claim on water rights, in the light of SOE sales and the privatisation of water. Never mind the support for National’s right wing policies that have “kicked Maori and the poor and dispossessed” in the guts? No. That is simply not good enough. A political party doesn’t simply walk away from it’s responsibilities and track record and expect all to be forgiven at the following election. The only “gut kicking” and “walking away” will be voters from the Maori Party. As it should be. God knows that is the only sanction that voters have against political parties that betray their interests. 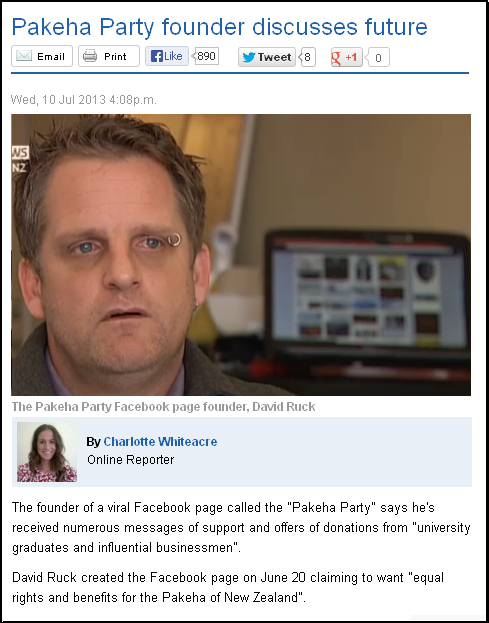 As of 1pm, 14 July, the so-called “Pakeha Party” had 55,495 “likes” on it’s Facebook page. By contrast, the Conservative Party received 59,237 Party Votes in the 2011 election. That wasn’t enough to win seats in Parliament. 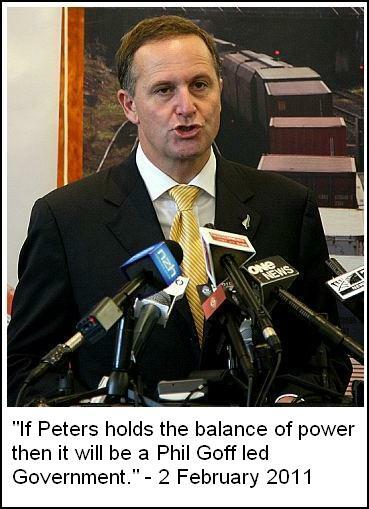 So a vote for any prospective Pakeha Party will be a wasted vote. Nice one, David; marginalising the racist vote in New Zealand. You’ve done the country a service. The Pakeha Party has a website up and running. I haven’t read the whole thing, as I have more important things to do (paint is drying and needs to be studiously watched). In this modern age to the best of our ability we will abolish all racism and/or separatism within New Zealand setting an example for the rest of the world. We will ensure all races in New Zealand (particularly Maori) who have been a part of forming & establishing New Zealand and it’s history are well preserved, very cherished and heavily promoted wherever & whenever possible. This is a democratic society – the past is the past – no one should be handed anything for free these days based on their ethnicity. No guaranteed seats. No Maori only anything. We all have an equal opportunity in our geographic locations this day in age. To solve our issues we need to give a firm but motivational hand to the poverty stricken in the poverty stricken areas with low trade. Just what Maori need. Not a sound economic base upon which to create jobs and build their independence – but to be “cherished”. Will that involve Mr Ruck and his supporters giving them each a hug and a cuddle?! And what does “the past is the past – no one should be handed anything for free these days based on their ethnicity” – mean?!?! What are Maori being “ handed … for free these days based on their ethnicity?! Is Mr Ruck (or whoever wrote this childish garbage) referring to Treaty settlements? Is he referring to land that was illegally confiscated by the Crown or settlers in the 1800s, and even the early 1900s? 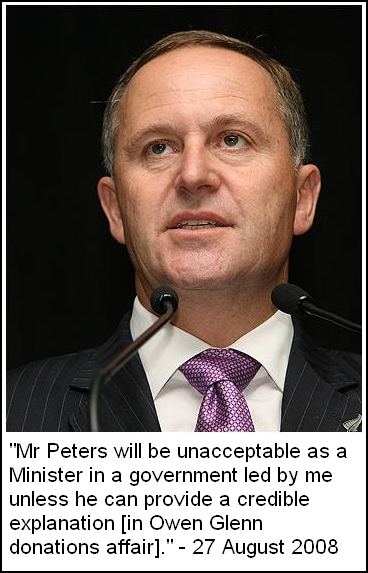 Is he referring to scholarships awarded to Maori youth, to attend University. Scholarships that are paid by IWI and not the taxpayer? Though if Mr Ruck refers toThe Treaty as “the past is the past“, I wonder if he’d dare say the same thing to our American cuzzies about their Constitution, which was enacted 51 years earlier than the Treaty of Waitangi? Or would he suggest that the Magna Carta – signed 625 years prior to the Treaty – the basis upon which our judicial and civil freedoms are based on – is also “the past is the past“? If Mr Ruck and his followers maintain that the Treaty is out-dated – I look forward to them pointing to the document’s expiry date. It’s fairly obvious that Mr Ruck and his supporters all hold one thing in common – a shocking and tragic lack of understanding of history and only a cursory knowledge the Treaty settlements process. They hold to the erroneous belief that Maori are being handed [land and money] for free. A little knowledge is a dangerous thing, said Albert Einstein. For good reason; 55,495 do not know our own history and the acts of violence that stripped Maori of their lands and possesson – and benefitted white colonials in the process. One Law For All is the Pakeha Party’s slogan. We can start with returning that which was stolen from Maori. * *Includes allowing up to 17 per cent of pokie machines and automatic table games (in restricted areas only) being able to accept banknotes of denominations greater than $20. SkyCity chief executive Nigel Morrison says his casino’s pokies are only to blame for a minuscule amount of gambling harm, instead placing the blame on Lotto and the TAB. Yesterday a bill allowing SkyCity to install hundreds more pokies and gaming tables and operate until 2048, in exchange for building a $400 million convention centre, passed its first reading 61-59. It was supposed to be a conscience vote, but MPs voted along party lines, as expected. Gambling support groups and the Opposition say the move will create more problem gamblers, but the Government has always maintained the economic benefits outweigh any potential harm – and Mr Morrison agrees. Appearing on Firstline this morning, Mr Morrison said SkyCity’s contribution to gambling harm has been blown “way out of context”. “We’ve only got 1650 machines, right – there are nearly 20,000 machines in New Zealand. questionnaires. This is between about 10,000 and 60,000 people. gamblers, even if they play it every week. It’s the old “my evil is less than other evils, so that makes me ok” argument. Taking this circular logic to it’s mad conclusion, no one could do anything to address a problem, because someone else will point further down the “food-chain” as being “worse”. It is so insane that one wonders how the human race could have evolved from their lemur-like ancestors because nothing would ever be achieved. 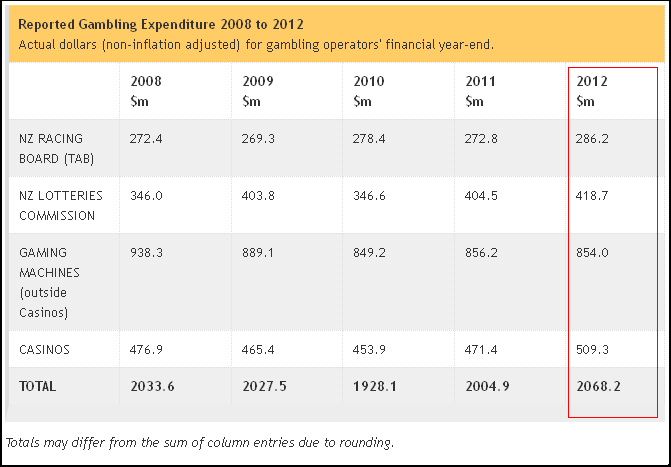 Gaming machines alone rose from$632 million in 1991 to$7,921 million (nearly $8 billion!) in 2007! So business is pretty damned good for an industry that is basically parasitic; non-productive; and causes considerable family disruption and social harm. In terms of destructiveness, it is right up there with alcohol abuse and hard drug addiction. Morrison is a lucky man. He is getting a good deal from Key and his ministerial cronies. It is no secret that National is so desperate to generate economic growth and job creation that they are willing to tolerate problem gambling mushroom as a result of more gaming machines and tables. This is a shabby government that is willing to turn a blind eye to social harm and shattered families. Those who know the full story of secret dealings between Key and Skycity will laugh with derision at Morrison’s comments. All along this has been a corrupt, shabby arrangement between National and Skycity – made even worse as Key tries to bind future governments to this deal. 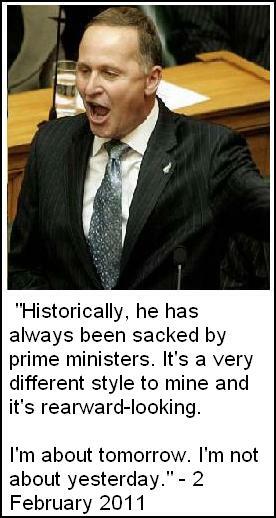 Now he’s pissed off that more and more New Zealanders are becoming concious of this shonkey deal and questioning it? Well, more and more people are not liking what they’re seeing. You can bet on it, Mr Morrison. If the National-sponsored New Zealand International Convention Centre Bill is passed in law, the convention centre is expected to be completed in 2017. Contrast that to the Auckland rail loop which Key wants to start in 2020. This is symbolic of the National government’s priorities. There is unholy urgency to implement a law to build a convention centre, with attendent increased gambling, and predicted increase in gambling harm. But no great hurry or sense of urgency to build public transport to free up Auckland’s roads from gridlock. Public transport and improved traffic flows: low priority. This, to me, illustrates why New Zealand will always continue to lag behind Australia and other developed nations – because a segment of the population will always continue make bad choices and vote, unthinkingly, for political parties that have short-term views for our country. It will be interesting to see what priority Aucklands voters have in 2014 (if not earlier). What will they vote for? Improved Rail and road usage? Your city; your choice; your consequences. 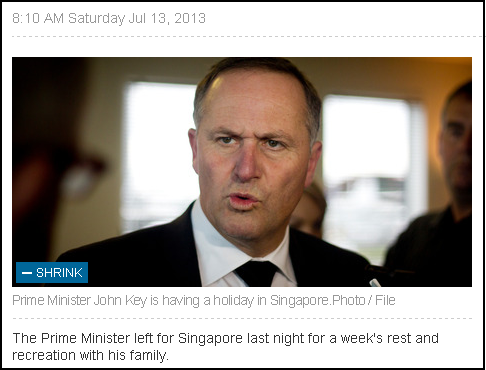 John Key, Prime Minister, and Minister of Tourism is busy working on his portfolio. In Singapore, where he is on holiday. Nice one, John. Good to see you have such faith in our own tourism sector. This blogpost was first published on The Daily Blog on 15 July 2013.
the GCSB and new spy legislation. 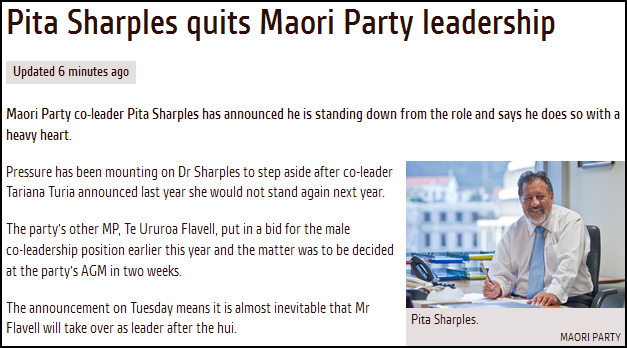 Pita Sharples has effectively taken responsibility for the Maori Party’s poor showing (third place) at the recent Ikaroa-Rāwhiti by-election. That result was an indictment on the Maori Party’s decision to support an increasingly shakey government that is losing support in more accurate polling. Hekia Parata – lost part of her port-folio. In essence, a partial sacking. 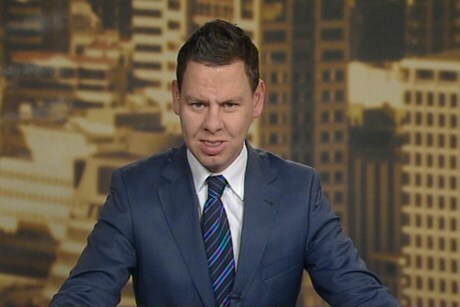 Aaron Gilmore – forced to resign from Parliament. John Banks – facing charges in Court. If found guilty, he will hve to resign. Peter Dunne – Party de-registered; lost his ministerial portfolios; and becoming increasingly oppositional to National’s policies. An early election this year (or early next year) is becoming more likely with each passing crisis. Not a good time for National. On 1 July, John Key announced that Paul Neazor would be replaced in his role as Inspector-General of Intelligence and Security (for the SIS and GCSB) by former-Judge Andrew McGechan. Key says that McGechan’s role will be on an “interim” basis, instead of the usual three years, as the GCSB and Related Legislation Amendment Bill is currently being considered by a Parliament Select Committee. However, with Peter Dunne wavering on this issue; with mounting public opposition; and god-only-knows which way Winston Peters will jump; the passing of the GCSB and Related Legislation Amendment Bill is by no means guaranteed. The office of the Inspector-General must be expanded; properly staffed; and appropriately funded. At present, the Inspector-General’s role is a part-time position, with no permanent staffing. Our Inspector General is faced with oversight of two intelligence agencies with a combined staff of around 520. In effect he is out-numbered, out-resourced, and consequently, out-manouvered. This, I believe is the real problem surrounding our security-intelligence agencies – not the legislation needing “tightening up”. The legislation is tight enough as it is. It just needs to be obeyed. The Labour Party’s call for a full public commission of inquiry on this matter cannot be ignored any longer. If Key wants cross-party support and public buy-in to secuirity/intelligence issues, then it must be open to all political parties and the public to contribute to the debate. As matters stand now, if National forces through unpopular, undemocratic, and ultimately counter-productive laws – an incoming government will be bound to amend or repeal it entirely. This is grossly wasteful use of the Parliamentary process and taxpayer’s money. This blogger hopes that the GCSB and Related Legislation Amendment Bill is set aside. Aside from National ministers and a few misguided rightwing bloggers, there is very little support for this proposed legislation. Ex-radio host-come-National politician – known for her acerbic and often nasty tongue in Parliament’s debating chamber – has copious amounts of egg on her face. The morning after National’s resounding victory she sent a strong message to Auckland mayor Len Brown, saying there would be a CBD rail link before a second harbour crossing “over our dead bodies”. North Shore National MP Maggie Barry said there was a “flurry of excitement” about the suggestion the North Shore could get another link to the city. I suspect there’s enough egg on Ms Barry’s face to cook up a decent size omelette. 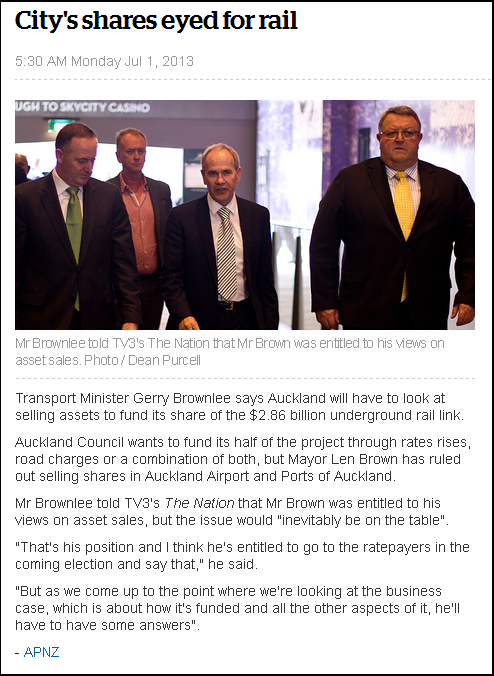 Acting more reminiscent of a feudal Baron ruling over his fiefdom, Brownlee is treating Mayor Len Brown as a vassal, forcing Auckland City to obey National’s diktats. I wonder what Aucklanders think of this kind of high-handed Ministerial control being exerted over their city – all the way from Wellington? It must be demeaning for Aucklanders to realise that their elected local representatives are being treated like puppets, and that real power is being exerted from the Beehive? So much for the quaint notion of democracy. So much for Aucklanders being in charge of their own destiny. The Government will work in partnership with the new Auckland council to improve the city’s transport systems, Prime Minister John Key says. He said today the Government shared Mayor Len Brown’s vision of getting Auckland moving and it was a government priority as well. “The Government will work in partnership with the new Auckland City Council on what comes next, and contribute its fair share to the continuing goal of improving transport,” Mr Key said at his post-cabinet press conference. 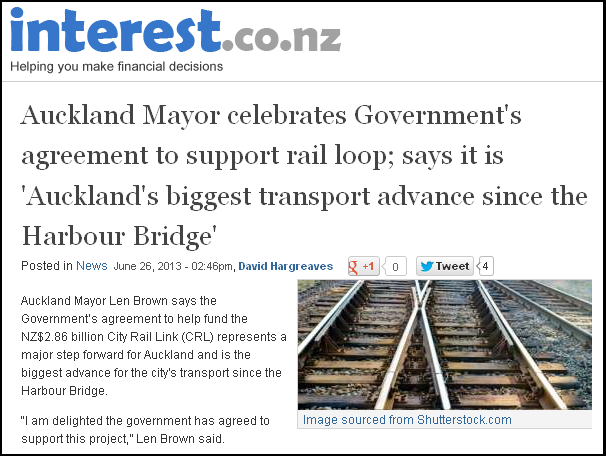 Having a Minister of the Crown attempting to bully Auckland to sell it’s assets in not a “partnership”. And just because National has engaged in an act of wilful economic sabotage by it’s agenda of partial asset-sales – is no reason to expect others to follow that lunatic policy. 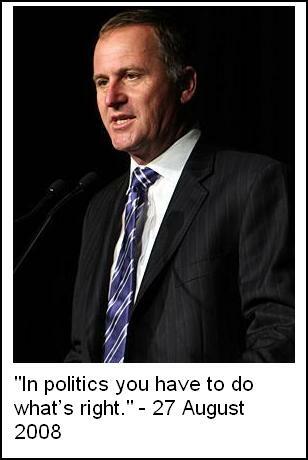 Gerry Brownlee should take note. He is playing with political fire, and a million votes in Auckland may come raining down on his (and other National MPs’) head. How much does Brownlee really want to piss that many voters off? This blogpost was first published on The Daily Blog on 3 July 2013.